As my daughter is about to celebrate her 21st birthday this month, as cliché as it sounds, time truly has flown by. She has grown to be a confident young woman in the blink of an eye. She has made the evolution of time through the different passages, from her initial stepping out to the world of primary school, to exploring the limits of her teen and secondary years; she is now a confident, active university student. This moment in time reminds me of how important it is to appreciate the passage of time and acknowledge the people and events that shape our lives. As I have been reflecting on my daughter’s birthday, it led me to reflect on the rapid evolution of the intercultural world over the past 21 years. In the mid 1990’s, both China and India were emerging powers, opening their markets and expanding their economies to the global marketplace. We have experienced the explosion of outsourcing, particularly in terms of manufacturing and IT throughout many parts of Asia, Europe and South America. The Internet was in its infancy, mobile phones were cumbersome and expensive, social media as we know it today, Wi-Fi and Google didn’t yet exist. Today smartphones are commonplace; we spend an inordinate amount of time on our phones using them for a whole myriad of personal and professional purposes. Yet, although we more interconnected than we have possibly ever been and have much greater social reach, the quality and depth of conversations appears to be overlooked. Depression and anxieties are increasing; and our sense of community seems to be declining irrespective of this interconnectedness. We are however now interacting more than we did in the mid 1990’s with others from different cultural backgrounds. The affordability of air travel has seen a big shift, migration has increased and businesses of all sizes can now have a much bigger global footprint. Yet at the other end of the spectrum, global conflicts seem to have increased. There is still an unacceptable high number of displaced people around the world, we are experiencing high levels of religious intolerance, terrorism and a lack of acceptance of difference. It seems that the need for Cultural Intelligence is greater today than it was 21 years ago; however disturbingly people continue to need convincing that it is an integral part of human success. There is much work to be done. I feel that my daughter’s generation will carry the mantle for the next phase of development in the cultural intelligence arena as they tackle some of the issues facing the planet such as eradication of poverty, climate change, environmental degradation, water and food availability, education rights, gender issues and world peace. Felicity has lived worked and studied in Asia for the past nine years. This book began as a research project. While on this journey, she recognised that there was a lack of management texts offering guidance to managers and leaders on how to develop culturally intelligent workforces. A World of Difference targets individuals working in global teams, managers, human resource professionals and leaders of global companies seeking to minimise the risks and unlock the strategic potential of cultural diversity. 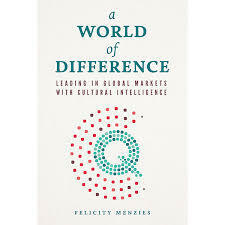 A key takeaway from the book is what Felicity refers to as ‘authentic exchanges’. These authentic exchanges extend to a culture, via experience and reflections with others from diverse cultural backgrounds. They are the key to improving cultural knowledge and CQ, such as worldviews, know-how, judgments, and cultural values, assumptions, beliefs, and norms. The book is well researched and peppered with some great anecdotes, personal stories and pragmatic strategies.